A new compilation of fresh blues, featuring lyrics by Pete Thelen. 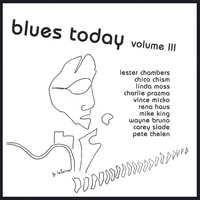 PETE THELEN’S LATEST BLUES COMPILATION ‘BLUES TODAY VOL. III featuring himself in collaboration with some of his blues friends, which just so happens to be some of the best blues artists I’ve heard in quit a while! The Musicianship on this latest compelation is of the highest quality. Many of the artists are known and respected highly in the music world, such as legendary soul singer Lester Chambers of Chambers Brothers renown, Chico Chisma is also a legendary drummer…. Go to www.blues-today.com to learn more about Pete Thelen and his greatest contribution to date titled “Blues Today Vol. III”. BluePower Review: Blues Today Volume Three! An eclectric Blues treat from BT PRODUCTIONS, this new CD features some very fine artists including LESTER CHAMBERS, K.K. MARTIN, CHICO CHISM, LINDA MOSS, CHARLIE PRAZMA, VINCE MICKO, RENA HAUS, MIKE KING, WAYNE BRUNO, CAREY SLADE AND PETE THELEN. Pete Thelen, the driving force behind this great series of CD’s, has written most of the lyrics to all the cuts as well as arranged and produced. BluePower picks are: “Wind Up From Mexico”, “Blues Today” and “Never Stray”. This CD is a great listen when accompanied with a good bottle of wine, someone you love and a stormy night. Check it out! Singing blues tunes today needn’t be much different from yesterday. The topics are the same. Our manner of expression is the same. In many ways, we face the same problems today that our grandparents and their parents faced early on. Ten originals by Pete Thelen share that comfort. He’s collaborated with Mike King and Charlie Prazma on most of the tunes. Each song is performed by a different ensemble. Thelen sings “Reunion,” with Prazma on guitar and bass, Paul Wood on piano and Bruce Penn on drums. “We’ve come a long way,” he sings. Boogie-woogie and a contemporary attitude give fresh air to the refrain, “All I want to do is sing the blues.” Chico Chism sings the title track, which includes a powerful harp performance by Mark Dennyand a soulful guitar solo from Greg Sheldon. Linda Moss belts out a strong warning on “Storm A- brewin’,” a slow, driving blues that features Prazma’s fiery guitar. He sings “Thumbnail Moon,” a loping ballad with fiddle, accordion, dobro, mandolin and more. “Alameda” is a special selection created by Vince Micko. The rock ballad oozes strong emotions, as Micko sings about a special woman. Thelen’s lyrics are included with the liner notes, making this one a valuable addition to the household blues collection. Rena Haus sings “2nd Shoe” in a soulful, Ray Charles-like setting with piano, organ, bass and tenor sax. It’s a lovely tune about the kind of things we take on our shoulders every day. Wayne Bruno sings, “I never stray far from the blues” slowly and deliberately, and Carey Slade sings about life-long lovers elsewhere on this highly recommended album. Mike King sings Zydeco on “Seem To Be,” another common sense tune about the things we see every day. “Sometimes, things aren’t what they seem to be,” King says. No kidding. The very same message that our ancestors faced way back when is still on our blues agenda today. Pete Thelen is that rare breed of musician that enjoys recording and releasing music by other artists as much as his own material. Each of the Wisconsin-based singer/songwriter Blues Today volumes is more a labor of love than anything else; see. this is not a record label owner putting out the music of others; the soft-spoken Thelan is rather a passionate fan. Thelan is now set to release Blues Today Volume III, which he hopes to be his most ambitious, well-received effort yet. The previous two B.T. compilations received media praise from both print and radio from coast to coast. Thelan has an Orange County connection, too – his 1999 B.T. Volume II compilation was released on O.C. musician K.K. Martin’s Ranell Records imprint. Martin and legendary soul singer Lester Chambers (of Chambers Brothers renown) are also part of the strong eleven-track lineup on BTVIII. For more info. on BTVIII and/or to order the CD, log onto www.blues-today.com.